What’s your ideal Saturday night at home? Livetweeting the pizza I’m eating. Finishing the next chapter of my latest fan fic. Watching a rom-com while buried under a sea of blankets. Rewatching all the terrible movies with my favorite actor in them. AGAIN. How do you decide to start watching a new TV show? My favorite actress is in it. Duh. I’ve heard there’s off the charts chemistry between the leads. I’ve seen really pretty gifs of scenes on Tumblr. All my friends have threatened to abandon me if I don’t watch. What social media platform best describes your personality? Instagram. Ooh look, pretty things! Twitter. It’s important that everyone know everything I’m doing. Tumblr. Let me share a novel-length post about my rage. YouTube. I’m going to be famous someday. What’s the most upsetting to you? Internet trolls who disagree with me. You’re about to see your favorite actor on stage. What are you doing? ALL CAPS TWEETING OF COURSE. Taking photos of everything. I want to document this night for posterity. Scoping out the exits for potential autograph signing opportunities. Going to the bathroom twenty times so I don’t have to miss any of the show. What makes you ship a couple? Umm, they exist and are standing in the same room together? A good backstory full of angst and heartbreak. I have an ongoing obsession with one of the actors. They have a huge following online. How do you normally watch a TV show? My laptop is out and I’m posting all my reactions on social media. I only really pay attention when my fave is in a scene. I wait for people to flirt and then my heart explodes. I take lengthy notes and write a recap afterward online. What is the worst thing that could happen to your favorite character in a book? They fall in love with another character I don’t like. WHY???? They are cast as a celebrity I don’t like in the movie version. NOOOO. The fandom hates them and doesn’t treat them like a precious cinnamon roll. The author never develops the character. RUDE. Which are you more likely to be thinking about in a boring meeting? An idea for an alternate universe fic. How shiny and perfect my fave’s hair is. I would stop a popular show from getting cancelled. I would never write that terrible fan fiction. What was I thinking? I would stop my favorite actor from doing that Lifetime movie. I would convince a writer not to sink my ship. You are The Shipper. For you, fangirling is all about finding those two love-struck characters who make you cry unicorn tears. You spend hours daydreaming about your OTP and texting headcanon to your friends. You’re yawning at work because you stayed up too late reading fan fic. The shipper knows that if you look closely enough at any two people, you can find the spark and create a wildfire of chemistry. This makes you a hopeful fangirl, one who’s not afraid to use her imagination or to see the best in people. Check out fangirltherapy.com for more information on THE FANGIRL LIFE book! You are The Die Hard. Unlike some fans, your affections don’t change as often as the weather. Your dedication to your favorite character or actor is unparalleled, and you’ll go to unprecedented lengths to meet them in person. You’d rather delete your own perfect selfie than pictures of your fave on your phone. Because you know that when you love something, you commit. This makes you a loyal friend both offline and online. You are The Creator. For you, fangirling isn’t about passively appreciating something—you have to jump in on the action. Whether it’s writing fan fic, creating fan art, reviewing books, or developing a fan site dedicated to your fave, you don’t see the need to separate your own talents from your fangirl loves. You know that stories don’t end when the credits roll, and that the fangirl is made to throw her own imagination into the mix. This makes you an ambitious but thoughtful fangirl, one who isn’t afraid of a challenge. You are The Social Butterfly. You didn’t set out trying to be popular online, but somehow everyone wants to follow your account or read your reactions to last night’s episode. You have more Internet friends than you can count, and you aren’t shy about talking about your fangirl passions to people offline. Whether it’s author events, conventions, or movie screenings, you somehow manage to be where the magic is happening, and you’re making more fangirl friends along the way. This makes you an honest and inspiring fangirl, often a role model for girls who might be embarrassed about their feels. Do you survive boring meetings by imaging two fictional characters making out in a variety of settings? Have you posted a lengthy diatribe on the Internet defending a fictional character's choice? Do you get carsick from reading fan fiction on your smartphone? If you answered yes to any of the above, you're likely a fangirl - but what kind of fangirl are you? 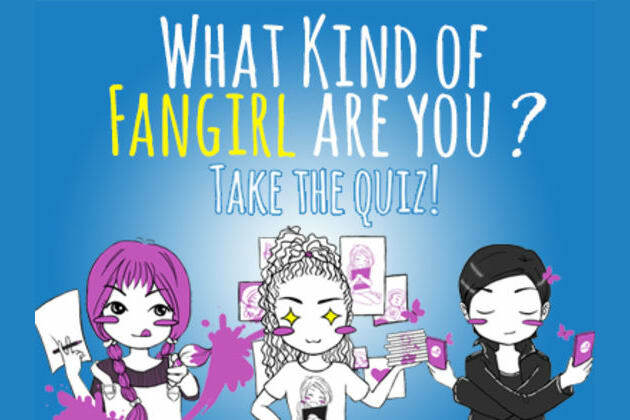 Discover your fangirl persona with this quiz, brought to you by THE FANGIRL LIFE, a new book on sale July 5! Visit Fangirltherapy.com for info.